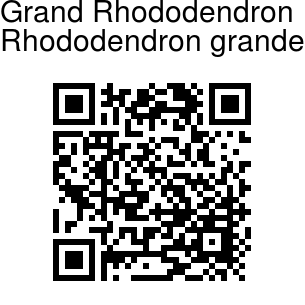 Grand Rhododendron is a handsome tree growing up to 12 m tall, with distinctive large leaves and large clusters of white flowers. Flowers are pale pink in bud, later white with purple blotches at the base. They are borne in rounded clusters of 20-25 flowers. Clusters are up to 18 cm across. Flowers are obliquely bell-shaped, 5-8 cm long and wide, stamens 16, unequal, ovary glandular and hairy, stigma large, reddish, disk-like. Leaves are very large, 15-38 cm long, oblong to inverted-lanceshaped, shining deep green above thinly covered with slivery-white hairs on the underside. 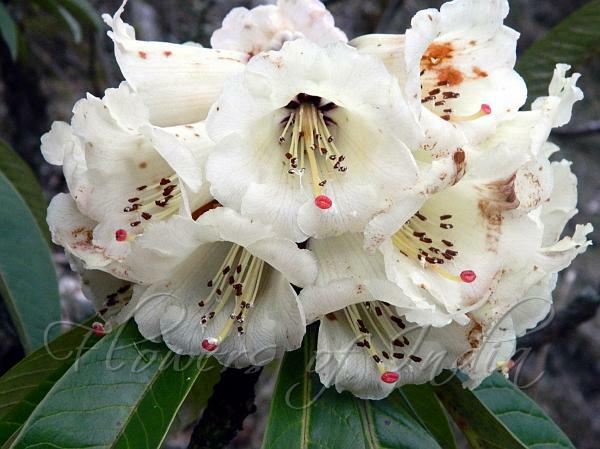 Grand Rhododendron is found in Eastern Himalayas, from E Nepal to SE Tibet, at altitudes of 1700-3000 m. Flowering: March-April. Identification credit: Jaya Upadhyay Photographed in Tawang Distt, Arunachal Pradesh.